If you are a resident of Dhanmondi and studying in an institution located in Baridhara, would you mind cycling to your destination every day? Tausif Farhad, a student of Independent University Bangladesh (IUB) does that to save the extra 45 minutes of the day, previously which used to be wasted on road while travelling by bus. Question arises; is that physically convenient? 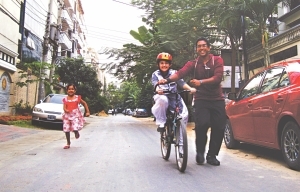 Tausif, an advisory council member of One Degree Initiative (1dI), a youth-led non-profit organisation and a cycling trainer of their current project “Degrees on Wheels” asserts, “First few days might be extremely tiring but you have to have the motivation that it is done for the betterment of you and your surroundings. Undeniably, practice will increase your stamina and confidence”. “Degrees on Wheels” (DOW) is a project that aims to signify the positives of cycling among youth especially students through various activities, “Training on Wheels” being the major. Starting on October 28, 2011 the year long training programme is facilitated by regular, experienced cyclists to anyone interested, absolutely free of cost. Dhaka has been divided into zones like Dhanmondi, Gulshan, Uttara, Baridhara, each with good number of trainers. Anyone interested in cycling is welcomed to contact his or her nearest zone trainer and start training. Even those who do not have a ride might get a spare one from the team. In a city like ours where the streets are no less than war zones, how safe is it for the students to hit the roads with bicycles? Perhaps a valid concern of many students and their parents. “Neither the state of roads are going to change nor will someone learn to cycle overnight. We are encouraging to take the training first and start with small ranges. Previously we used to have cycle lanes which are dissolved now. Until and unless we merge as a strong force of cyclers we cannot really push the government,” explains Mushfiqur Rahman, Advisory Council Member of 1DI. 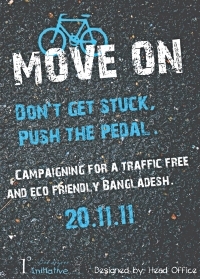 Today DOW is hitting the streets of Dhaka with all their members and trainees in a bicycle rally. With leaflets and banners containing interesting messages on cycling, they are reaching as many schools, colleges and universities as possible, zone wise. Targeting students from seventh grade and above they are encouraging them to cycle on their way to schools which might lessen the traffic on roads remarkably. “We want to change another mind set. Well-off parents think that private vehicles are a symbol of status. So why should their children ride on cycles when they have a car or can afford riding CNGs? But cycle is a great aid to one's independence. It is financially feasible for a student. One can drive it on his or her own, whenever needed. Cycle repairing spots are available everywhere. He or she doesn't have to depend on parents, drivers, friends' rides, rickshaw pullers or anything else. It is beneficial for sound health also”, exclaims Tousif. All the registered members who are hitting the roads today went through two workshops on safety measures. Those who were considered 'not ready yet' to cycle on the main roads were recommended to continue with the training and today they are aiding the campaign as a 'foot team'. They are walking to different institutes and encouraging both students and faculty members to join. The youth craves for fun, adventure and a healthier life. What can be a better option than cycling? Facebook being the main mode of communication, DOW plans to arrange such awareness raising campaigns once or twice a month. To know more about “Degrees on Wheels” and “Training on Wheels”, visit the “One Degree Initiative" page on Facebook, www.facebook.com /1difb and weave your path towards independence. 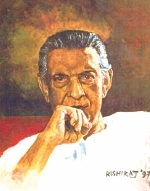 Film director, producer, screenwriter, writer, music director and lyricist Satyajit Ray studied at Ballygunge Government High School, Kolkata, and completed his B.A. in economics at Presidency College of the University of Kolkata, though his interest was always in fine arts. In 1940, his mother insisted that he study at the Visva-Bharati University at Santiniketan. Ray was reluctant due to his love of Kolkata, and the low opinion of the intellectual life at Santiniketan. His mother's persuasion and his respect for Tagore finally convinced him to try. In 1943, Ray started work at D.J. Keymer, a British-run advertising agency, as a "junior visualiser," earning eighty rupees a month. Although he liked visual design (graphic design) and he was mostly treated well, there was tension between the British and Indian employees of the firm. The British were better paid, and Ray felt that "the clients were generally stupid." Later, Ray also worked for Signet Press, a new publishing house started by D. K. Gupta. Gupta asked Ray to create cover designs for books to be published by Signet Press and gave him complete artistic freedom. Ray designed covers for many books, including Jim Corbett's 'Maneaters of Kumaon', and Jawaharlal Nehru's 'Discovery of India'. He worked on a children's version of 'Pather Panchali', a classic Bengali novel by Bibhutibhushan Bandopadhyay, renamed as 'Am Antir Bhepu' (The mango-seed whistle). Designing the cover and illustrating the book, Ray was deeply influenced by the work. He used it as the subject of his first film, and featured his illustrations as shots in his groundbreaking film!